Family-friendly fun flick sure to produce that speck of dust in your eye. No, I wasn't crying. I just loved this Movie and I am a cat owner. Dog owners must watch. I loved this movie. Any dog lover would love the.movie. the dogs just acted like dogs. Story was just funny, happy, and sad enough. I would definitely recommend it. I was pleasantly surprised at how much I enjoyed this movie! I took my 8 year old daughter thinking it was another kids movie about dogs but at 41 I found the story line appealing and entertaining. It's cute, funny and will easily appeal to dog lovers both young and not so young! I was pleasantly surprised by this very good movie. Interesting, cute, sensitive, sometimes corny but really good. How one little dog brings a neighborhood together. No violence, no bad language, kids will love this. This was a great summer movie! The actors were great each portraying their own story with humour and empathy. loved the animals as well! It had a little bit of everything in it, especially for dog lovers. Cute story, predictable but entertaining! We enjoyed this movie. It was sweet with a nice story. Reminded us of Love Actually. This was an enjoyable movie. Three small stories accumulating as one all linked with adorable dogs. A delightful movie. An audience of all ages was able to enjoy the show. An evening of laughs, awws and even a few tears were shed. We left feeling good and with the urge to get a dog. A nice family-friendly summer flick that's well-cast, humorous, fun, sweet, and contains many "positive" messages. There's a little bit of everything in this movie, so I think it will appeal to families, dog-lovers, fans of romantic comedies, and people who are just looking for some light entertainment. Although this movie doesn't break any new ground, it's quite entertaining. Check it out! funny and heartwarming. a good family film! It was a funny, cute movie about dogs being friends with their owners. Also, it showed what mischief, joy, unexpected events dogs can bring into people's lives. Also there was a dog shelter closing down, so there were a great fundraising activities planned to raise money to relocate to another place, it was a very funny, entertaining movie which I would recommend. Thank you for the opportunity! A feel good movie. Totally enjoyable. Funny, touching and now I want a dog. I enjoyed this romantic comedy. Very enjoyable movie. My daughter and I laughed and cried. The dogs were awesome. Great for the whole family. My daughter and I had a fun time with the movie. It was a fun family film that had cute dogs that my daughter loves. A refreshingly light and funny movie. If you are a dog lover it is a must see and if you are not you will be by the end of the movie. 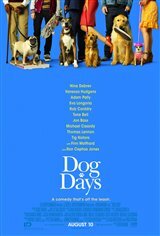 Dog Days is a fun-loving family movie that’s filled with lots of laughs and DOGS. It’s a feel good movie that will brighten everyone’s day. A great warm family movie. funny, touching, feel good movie. well worth a watch. A feel good, warm movie that the whole family can watch. It has some laugh out loud chuckles as you follow the lives of the dogs and their owners. This movie has a bit of love, a bit of loss with a serious amount of dog owner reality. Very enjoyable! This was a fun & funny movie. Heartwarming with some really good actors. I would recommend it for a good comedy, especially if you're a dog lover. There were good themes and a couple of great stories in the movie, but ..... the typical California weird crap and interracial stuff? Blah.... Many of you will disagree with my rating. Don't care. Bye bye now. Great FEEL GOOD movie! Just rolls along so quickly and laughter just follows! !